Thank you to Ben, Ben’s family, and all those who work so hard to put on the camp. You made two, no 500+, kid’s day! My wife and I are touched, almost to tears, by the gesture. Here We Go Steelers, Here We Go…and Go Big Ben!” — CDR Mark Ziegler, SC,USN; to the website’s Facebook page this afternoon. 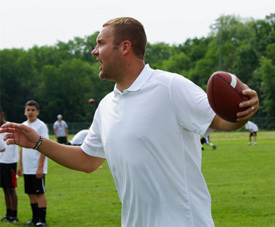 Passes come fast and furious, and so do catches, at Ben Roethlisberger’s Football Camp. Among the campers are Andrew Ziegler and his brother, Steven, courtesy of their father, Navy Commander Mark Ziegler. Dena Ziegler shared her sons’ stories on the Steeler quarterback’s website. Andrew sprinted down the sideline, as Mom shoots the video. Other campers cheer as he makes the catch. Then it’s his younger brother’s turn. A big stretch, and Steven comes down with the ball. You can also see video of the Ziegler Family’s amazing day at Steelers.com here. “Ben – THANK YOU so much for what you did at camp today for my two sons…making Steven’s 12th Birthday ‘the best birthday EVER’ and for giving Andrew the opportunity to make those great catches! Being a military kid and being away from their Dad hasn’t been easy, but you really made a difference in their lives today. Words alone cannot express the gratitude we feel. Thank you Ben!” — Dena M. Ziegler, via Facebook this evening. 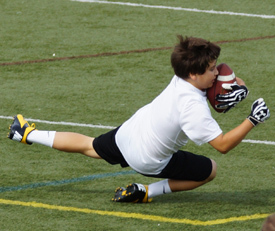 *Thank you to mom-in-attendance Holly Mead for sharing that photo of birthday boy Steven Ziegler catching Ben’s pass! “How awesome is @_BigBen7? Recognized and threw passes to two very special boys who’s dad is serving in Afghanistan. Way to give back Ben.” — Erik Vasquez, via Twitter this afternoon. “A most awesome group of Champions, 4sure 4real 4ever Black & Gold! !” — Valerie Jean Miller, on the hard working campers. “Ben has done a fantastic job with the kids again today!” — Brian Skripac, via Twitter. 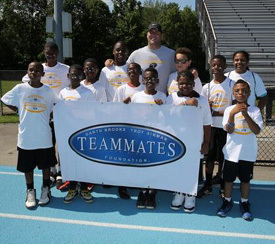 “Ben, Thank you so much for putting on the football camp for the kids. My husband and I were very impressed with how everything ran. My son had a blast and was so over the moon about catching a ball from you! “The second day of Ben’s has come to a close and we’re headed back to Ohio. Once again Ben’s camp was a roaring success!! The Pro Camps people said out of all their camps this year that Ben’s was the largest with over 500 kids. The Pro Camps organization did an excellent job putting on this camp. It seems they continue to improve and streamline the event with each passing year. Ben’s love for the kids is very evident in the way that he goes out of his way to make each camper’s experience a great one. Once again he threw a pass to each camper! Ben gets excited for the kids as they try their hardest to excel and have fun! It’s very funny to watch him with the campers because it seems he’s really just a big kid at heart! You can see seven pages of photos from the 2-Day Camp right here! *THANK YOU to everyone who shared their photos and comments from Ben’s Camp the past two days!